The Congress has so far fielded 10 candidates leaving five for the Left Front over a seat-sharing formula which, however, failed. 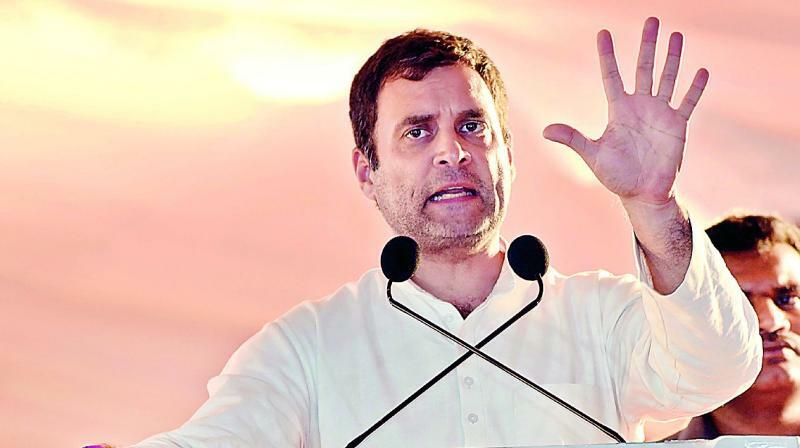 Kolkata: Kickstarting his Lok Sabha election campaign in West Bengal on Saturday, Congress president Rahul Gandhi accused chief minister Mamata Banerjee of running autocracy in the state. He questionned the unemployment and lack of farmers’ welfare during her rule while addressing a Congress rally at Chanchol in Malda. Mr Gandhi also pinned hope on the Congress to come to power in the state. His sharp attack on the Trinamul supremo in her turf comes two months after Ms Banerjee’s United India rally on January 19, which saw the presence of two Congress leaders. UPA chairperson Sonia Gandhi had showered lavish praise on her for trying to stich an anti-BJP alliance ahead of the Lok Sabha polls. The Trinamul, however, has fielded its candidates in all of the 42 seats in the state. The Congress has so far fielded 10 candidates leaving five for the Left Front over a seat-sharing formula which, however, failed. “Doesnt Bengal have any voice? Shouldnt the people of Bengal have any voice? Should an individual run the state,” he said. The Congress workers are killed and beaten up here. We will see to it once the new government is formed in New Delhi. Mamataji spends the whole day giving lectures only,” he said. “The farmers of the nation and Bengal appeal for loan waiver from Mr Modi. But neither Mr Modi nor Arun Jaitley and not even Mamataji waived off these loans. Chowkidar promised of jobs and farmers’ welfare. Has anyone been benefitted by his rule or even Mamataji here? No one is here. Please tell me what development work Mamataji undertook here in the last couple of years. Has anyone got job? Has there been any welfare of farmers here?” he asked the party workers at the rally. Without taking the name of two-time Congress MP of Maldah Uttar Mausam Benazir Noor, who recently defected to the Trinamul and even got a Trinamul ticket, Mr Gandhi claimed that she cheated the people. “You have voted the Congress here. But this time a person has cheated you. Keep it in mind that an old Congress candidate fooled you,” he said. He also placed Mr Modi and Ms Banerjee on the same page over spreading falsehood and making hollow claims. He not only accused the PM of lying “all day” but also tore into him over his “Chowkidar” campaign. Mr Gandhi noted that only the rich have “Chowkidar”.